SCOTWISE: DAILY ENCOURAGEMENT TUESDAY - CLASSICAL TESTIMONIES… MILDRED CABLE. Part 1. DAILY ENCOURAGEMENT TUESDAY - CLASSICAL TESTIMONIES… MILDRED CABLE. Part 1. Imagine. Your mission mentor is beaten to death, hacked into small pieces, and dumped in a pit, before you have a chance to open your mouth or land on the foreign shore she inspired you to go to. Not the most auspicious start for a mission career. But that’s how it all began for Mildred Cable, missionary extraordinaire, exactly 100 years ago as she set sail for China. Undeterred by the slaughter of hundreds of foreign missionaries and tens of thousands of Chinese Christians in the Boxer rebellion of 1900, the fearless 22-year-old couldn’t wait to get going. Despite a broken engagement, which devastated her, she remained true to a conviction she had received when she was 15. She was determined to devote the rest of her life to China. The “respectable” but “vigorous rebel” was to become one of Britain’s most courageous and intrepid travellers. Her descriptions of life in the Gobi Desert, earned her acclaim and admiration, not only in missionary circles, but also in the hallowed, men-only halls of the elite Royal Geographical Society, the Royal Central Asian Society and even Buckingham Palace itself. Captured by bandits, held to ransom and broken with fatigue, roasted and frozen by the desert extremes, hungry and desperately uncomfortable most of the time, Mildred spent the next 35 years with her beloved Chinese and urging others to do the same. She was convinced that only Jesus was able to liberate women, rescue abandoned babies, heal the deep wounds of inequality and right the wrongs of injustice that deeply permeated every strand of early 20th century Chinese life. Born in genteel Victorian Guildford in 1878, she was one of the first fruits of a revolutionary style of school that was more interested in a girl’s brains than her culinary expertise. Inspired to strive for greatness by headmistress Miss Agnes Morton and her deputy Maria Angell, the self-confidence, ambition and educational aspirations they nurtured were to stand her in good stead in the coming years. Tales of missionary heroes replaced fairy tales for the 12-year-old whose new-found faith spurred her on to look for the extraordinary in life. She was surrounded by creative women visionaries in the Guildford of the 1880’s, who had already begun to challenge poverty and injustice. But these women had yet to be entrusted with equality in church life. They became auxiliaries, unlike those who made it to the mission field who were independent, free thinkers, pioneers, teachers, church planters and builders. She first encountered a live missionary at 15, whose “rapturous smile, contagious zeal and a way of talking about the Lord … conveyed the impression that He was her constant companion”. Her comment: “I think the Lord wants you in China,” to Mildred at the end of a mission rally, at first repelled, but later propelled her on a course from which there was no turning back. 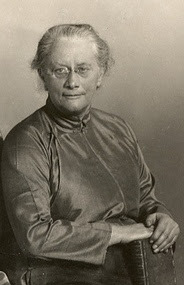 Attracted by the China Inland Mission (now OMF Intenational), whose express purpose was to live as the Chinese and to die with them if necessary, she trained in pharmacy, anatomy, midwifery and surgery. Her grief stricken parents, unable to dissuade their daughter from this suicidal course eventually resigned themselves to her decision. Her successful high street draper father escorted her to New York where he confessed that on the day she was born, he had dedicated her to foreign missionary service. She left with his blessing. The day she landed on those remote shores heralded the start of a unique 55 year partnership with Francesca French and her sister Eva who was to arrive later. They became known as the Trio. Starting in Hwochow in Shansi province, Central China, she finished 3,500 miles away in East Turkestan, part of the tumultuous Islamic North-West of the country. The church was reeling from the ravages of the Boxers. The Empress Dowager’s hatred of the “Foreign Devils” aggravated by a devastating drought turned the Chinese brutally and sadistically against missionaries and Chinese Christians. Thousands were torn to pieces by baying crowds and tortured mercilessly for their faith. Mildred’s first days and hours were spent listening to the paralysed and traumatised believers as their tragedies unfolded. The church desperately craved a new stimulus. The need to educate hundreds of illiterate girls scattered in Christian families throughout the province was irrefutable. Mildred’s fiery initiation to missionary life was as headmistress whose initial job was to teach the first batch of teachers not to teach, but to read and write themselves – not in English of course, but in the language she was only beginning to get to grips with herself. She rose to the challenge and within seven years had the school running militarily. Twenty years of toil, however, never diminished the “unspeakable joy” experienced by Mildred and her companions when she saw those for whom she had toiled and prayed “decide for Christ”. This was an unprecedented period in the history of the Chinese Church of the day, when the 95,943 believers swelled to 366,524 and 337 mission stations were established. Are you willing to do whatever it takes and give your all to win the lost to Christ? Then like, the Mildred Cable, put your hand in the hand of the man who stilled the water, and dare to follow Jesus wherever He leads you? Loving Father, I thank you for the life of Mildred Cable, and I pray that anyone reading this may be inspired by her testimony to give their life to you, and that you would use them in the same way, as you used the Mildred. By the power of the Holy Spirit, help me to be a person of like faith, that I may bring glory to your name. In the wonderful and mighty name of Jesus I pray. Amen. SCOTLAND'S GOAL AGAINST FRANCE... YOU BEWDY!